WHEELS: 20" X 8.0" ALUMINUM (STD), TRUE BLUE PEARLCOAT, TRANSMISSION: 8-SPEED AUTOMATIC 8HP70 (STD), TRAILER TOW GROUP IV -inc: Rear Load Leveling Suspension, 7 & 4 Pin Wiring Harness, Class IV Receiver Hitch, Heavy Duty Engine Cooling, Full Size Spare Tire, RADIO: UCONNECT 8.4 NAV -inc: SIRIUSXM Travel Link (subscription required), HD Radio, For More Info Call 888-539-7474, GPS Navigation, SIRIUSXM Traffic (subscription required), QUICK ORDER PACKAGE 25S -inc: Engine: 5.7L V8 HEMI MDS VVT, Transmission: 8-Speed Automatic 8HP70, POWER SUNROOF, MANUFACTURER'S STATEMENT OF ORIGIN, ENGINE: 5.7L V8 HEMI MDS VVT -inc: Dual Rear Exhaust w/Bright Tips, Heavy Duty Engine Cooling (STD), BLACK, LEATHER TRIMMED BUCKET SEATS. 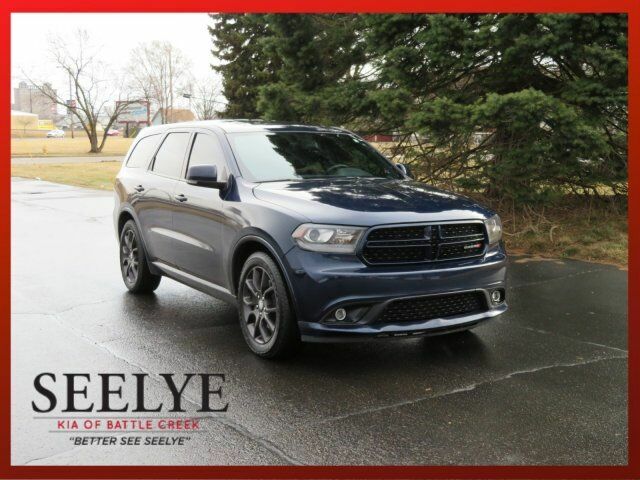 This Dodge Durango has a dependable Regular Unleaded V-8 5.7 L/345 engine powering this Automatic transmission. Valet Function, Urethane Gear Shift Knob, Uconnect Voice Command w/Bluetooth, Uconnect Access, Trunk/Hatch Auto-Latch, Trip Computer, Transmission: 8-Speed Automatic 8HP70, Transmission w/Driver Selectable Mode and Sequential Shift Control, Tracker System, Towing Equipment -inc: Trailer Sway Control, Tires: 265/50R20 BSW AS, Tire Specific Low Tire Pressure Warning, Tailgate/Rear Door Lock Included w/Power Door Locks, Systems Monitor, Streaming Audio, Steel Spare Wheel, Sport Tuned Suspension, Speed Sensitive Variable Intermittent Wipers, Side Impact Beams, Short And Long Arm Front Suspension w/Coil Springs. As reported by KBB.com: If you're shopping for a 7-passenger sport-utility vehicle that doesn't look and feel like a glorified pickup truck, check out the 2015 Dodge Durango SUV. In R/T and Limited trim, it can be quite cool and the Hemi V8 gives the Durango real attitude.